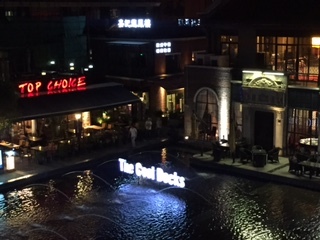 The Cool Docks are one of Shanghai’s newer attractions. It’s a little alcove of restaurants and bars about 500m from the ferry stop. 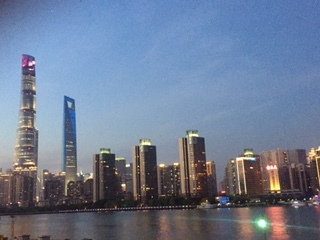 Due to an ongoing project to expand the bund, most of the area around was under construction. That kind of ruined the scenery, but once its done, there’ll be a fully connected riverside path. So Pretty!!!! When we got there, it was quite late and we were pretty hungry. We took a little loop to scout out a restaurant. My brother wanted Italian; he got Italian. 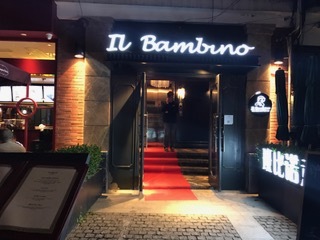 Il Bambino is the only Italian Restaurant in the Cool Docks. I personally don’t like Italian food and I was fully prepared to argue; however, I noticed 2 things: 1) The restaurant looked nice 2) Steak was 40% off! We followed a VERY courteous waiter in. The menu is not very large. It had a couple of appetizers, pastas, risotto, seafood and of course steak. Despite the steak promotion, the menu was definitely seafood heavy. So, onto the food. 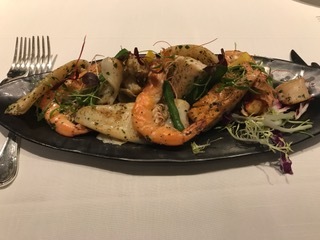 I had every intention of ordering steak, but the Mixed Seafood Platter caught my eye before I made it to the steak selection. The description promised calamari, crab, prawns, cod, salmon and lobster on a bed of spring vegetables and with lemon parsley juice. I expected a pile of grilled seafood coated in rich butter. When it arrived, I got a beautifully plated, but disappointingly small, portion of the promised seafood. It was well oiled, but the lemon cut through very well. On the other hand, the calimari and prawns were a bit overcooked 😦 More vegetables would also have been nice. Overall, a fresh and delicious dish. My brother went straight for the steak menu. 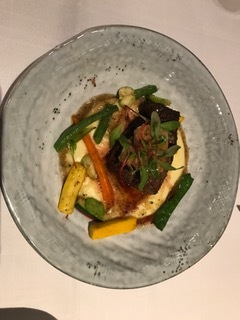 He order a beef tenderloin with foie gras, mushroom sauce and mash potatoes. It was, in his words, amazingly delicious. It was so good, in fact, that he ordered a second one. The steak was perfectly medium- rare and incredibly tender as well as well seasoned. 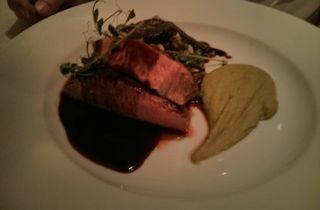 The mash looked smooth and paired perfectly with the sauce and foie gras. Not into fattened goose liver? No problem, just tell the server. On a side note, this dish does take quite a while to make. Be prepared to wait. My mom ordered a cut of veal with red wine sauce and potato puree. It too, was beautifully plated and extremely tender despite being ordered medium; however, it was very under-seasoned. Luckily, there was plenty of salt in the shaker. My dad ordered lobster linguine. Honestly, he would have been better off getting steak, but his choice. 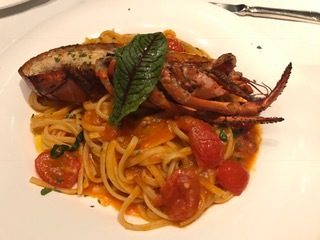 I’m not into pasta, especially when it’s drenched in an oily sauce, but I must say, the lobster was very tender. 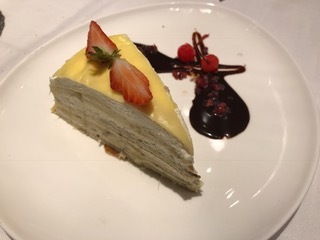 Apparently, as part of the steak deal, ordering the veal gets you a choice between tiramisu and durian cake as a free dessert. My brother hates durian and tried to get the tiramisu, but my mom ordered the veal. It was her choice; she picked the durian cake. It was pretty, but apparently the durian wasn’t fresh 😦 It was a pretty disappointing end to her dinner. Overall, Il Bambino is a great restaurant, but it could pay more attention to some little details. I think more time will bring more customers and the kinks should work themselves out. Anyways, that was the perfect way to spend what would have been a lazy Sunday evening. 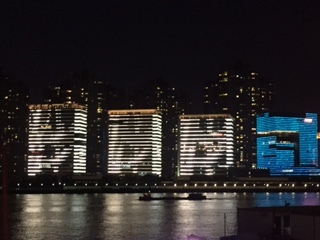 Hope you week is/was great! Bye!